Home Blog Apple Mac Thunderbolt 3, an exciting, superfast port with a but…. 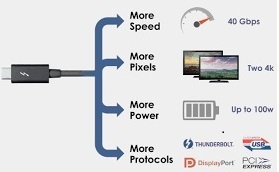 Thunderbolt 3, an exciting, superfast port with a but…. Traditionally a laptop has several different types of port for data transfer USB, SATA or in Apple world it’s called Thunderbolt.. My ancient laptop has about 6… Now though; the shiny MacBook 12″ and the new MacBook Pro Touch Bar are equipped with one- yes ONE type of connection. The MacBook was released with only one connection but the new MacBook Pro 15″ has four. The Thunderbolt 3 is a super fast wire (40Gbps) that lends itself to all of the data transfer and charging needs that the laptop has. This one type of connection alternatively called USB-C allows the user to connect all their ‘stuff’ though one type of lead and connection. That stuff you may want to use could be one of the new exciting 4k displays available to use alongside your MacBook Pro. As the MacBook Pro has four ports available… surely you can connect loads of ‘stuff’ to it! As we have a large customer base of creative designers and cinematographers we are assisting with many enquiries to these devices. The 13″ new MacBook Pro with TouchBar has TWO ports only. All devices connected have to share the same power and there may not be enough for all. The wire has 40Gps, if you have two 4K displays connected then that only leaves you maybe 10Gps to utilise. The displays will also take priority so if you are also going to add some other ‘stuff’ to the mix it will be slowed somewhat. Not great for external storage devices. The cables can also be expensive. As a Thunderbolt 3 is a revolutionary wire doing fancy stuff! The problem is that the connection that you use changes the speed at which it works. If you have a Thunderbolt 3 cable attached with the USB-C they will work super fast, if you are connecting using an external port with regular USB 3.0 connector than the speed at which it works will become greatly reduced. Another situation to get your head around is when you are mixing USB 3.0, Thunderbolt 3 and DisplayPort’s all at the same time. As soon as the line of wires is connected to a USB or DisplayPort stream it will lessen the power to that cable. You will need to think carefully about how you connect all of your devices at once. It looks as though, however, that the Thunderbolt 3 is the way forward… if you are thinking about updating and holding it off, now is probably the time to go for it. Thunderbolt 3 is here to stay so we might as well get used to it. With the HardSoft Return, Retain, Renew upgrade options you will never be left with outdated IT! HardSoft offers the new MacBook Pro 15″ on an Apple lease from just £16.30 +VAT per week or a MacBook Pro 13″ from only £14.70 +VAT per week. Make your IT upgrade affordable with Apple MacBook leasing today! We can get you a fast decision on finance and deliver next day. We offer the same great rates to new as well as established businesses, let us help your company to expand affordably. To get this great deal or discuss a tailor made quote from across our product range, speak to one of our Apple sales specialists on 0207 111 1643.